Bread Quest! 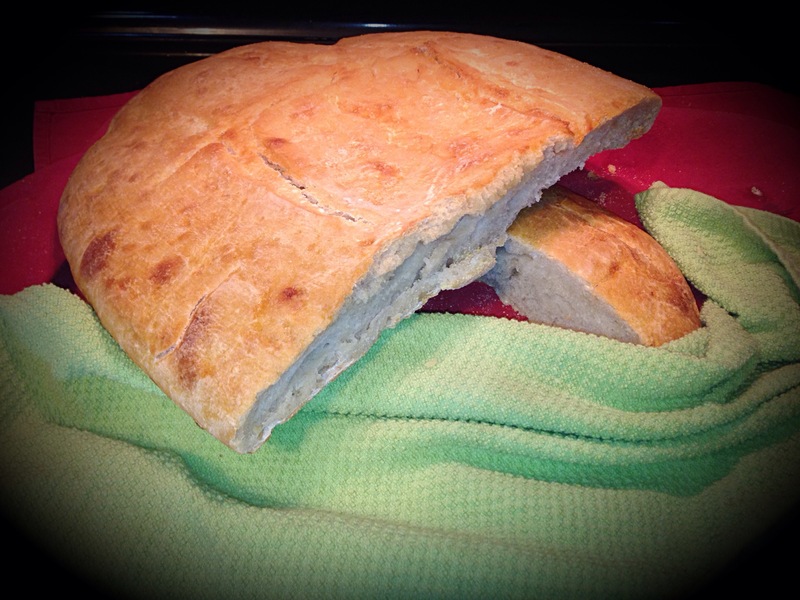 Sour Dough Lovers Unite! Journey to the perfect loaf! After learning that those with gluten intolerance may be able to successfully tolerate sour dough bread, I have been on the quest to find and make the perfect loaf of sour dough bread. I read where the sour dough starter actually cancels out the gluten. My sweet daughter, has an auto-immune disease which greatly benefits from a gluten-free diet. We learned that she does tolerate and digest sour dough bread. Of course, I am certainly going to do my part in helping her find quality foods that are within her diet. 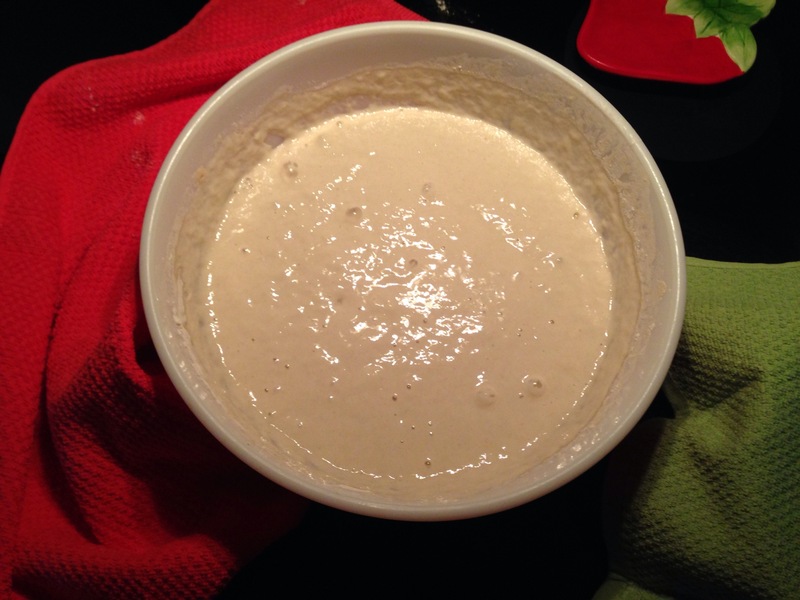 My first attempts at making my own starter were from “scratch”. 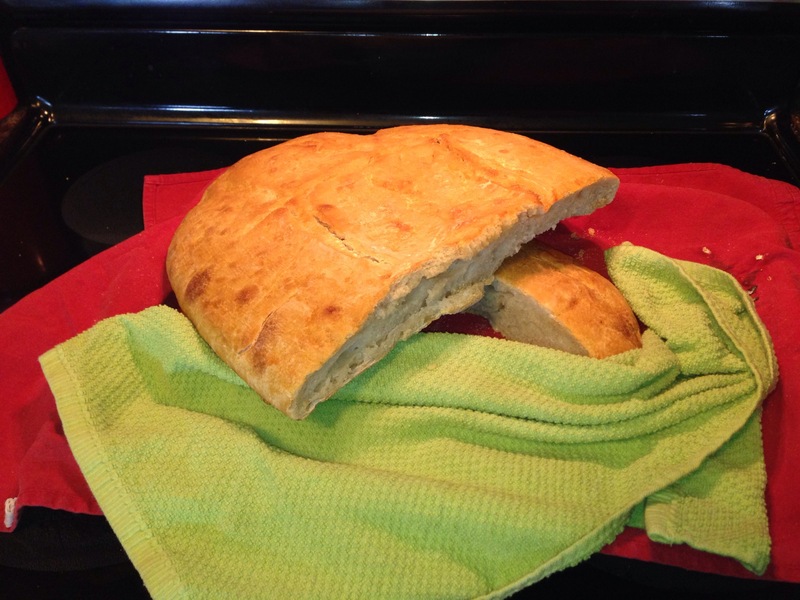 It took eight days to ferment the starter and begin baking. After six very dense, fair tasting loaves, I was able to make a pretty good loaf. My starter however, was a bit frustrating to me as it seemed to take about two days to proof a loaf. I also thought it needed to have a better taste. It arrives with a nice little crock to keep your starter preserved in. I found the detailed instructions a bit difficult to understand but I ended up with a good end product so I suppose I came close to following it correctly. 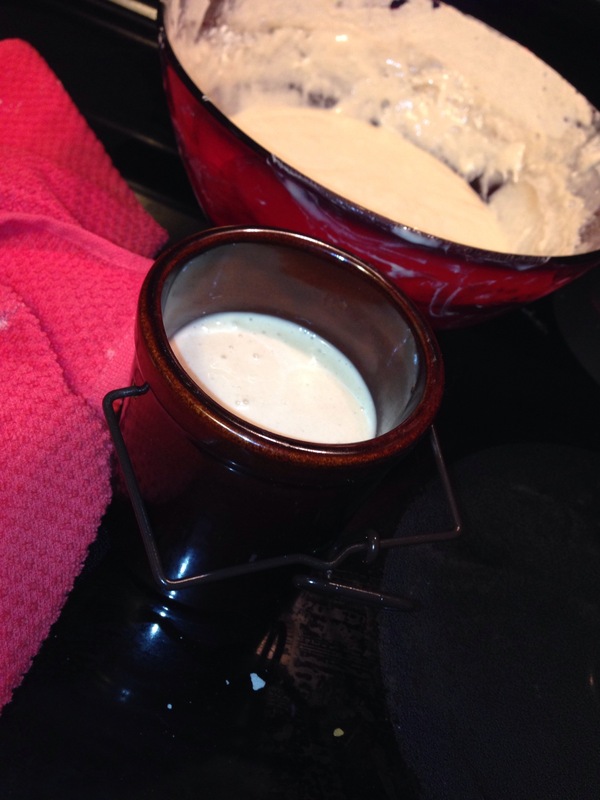 It begins by combining the starter with warm water and all-purpose flour. [caption id="attachment_437" align="alignnone" width="300"] Combining the starter packet with warm water and flour. important in the fermentation process. Note the large bubbles on top of the mixture. This is ready for division and feeding. For the remaining 72 hours, you will be stirring at regular intervals until the mixture reaches it peak (lots of active bubbles), then you will reduce to 1/2 C mixture and add one cup of warm water and one cup of flour. (If it is bedtime, you will increase the flour and water to 2 or 3 cups and cover for the night) Upon rising, divide, reduce to 1/2 C and feed with 1 C warm water and flour. The is the final division. Fill your crock with starter and refrigerate. Two days later, I had to bake bread to see how the new starter would work. The recipe is easy. 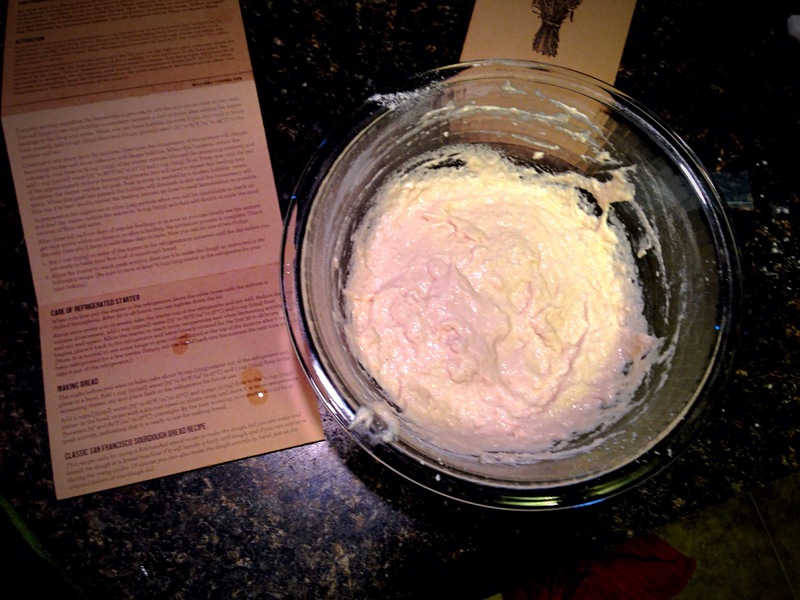 The night before baking, put 1/2 C starter in a bowl with 3 Cups warm water and 3 Cups flour. Cover overnight. The next morning, you will have beautiful starter called a sponge. It’s very bubbly! Take 2 1/2 Cups of the sponge and put it in your stand mixer, add 1 1/2 C flour and mix together. Allow it to rest an hour. 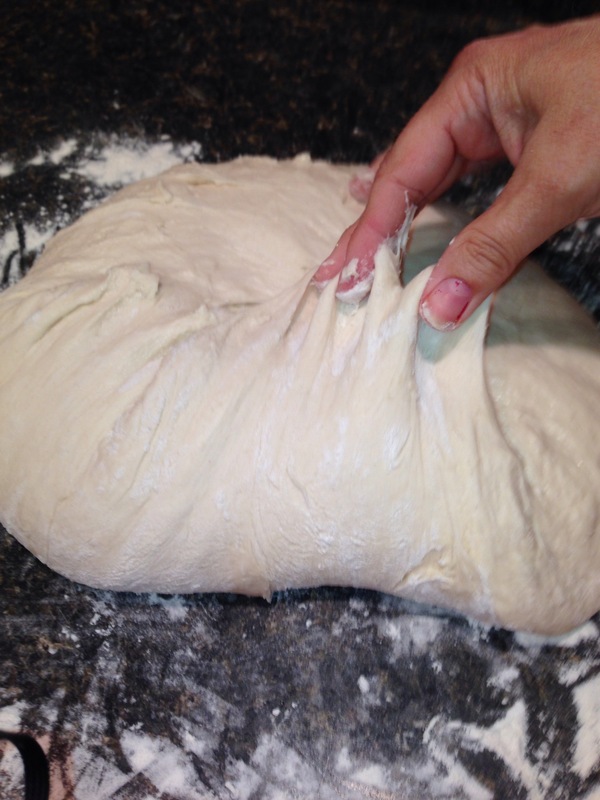 Next, add one more C of flour, put on the dough hook, add a tablespoon of salt and slowing continue adding flour until you have a moist, non sticky dough. 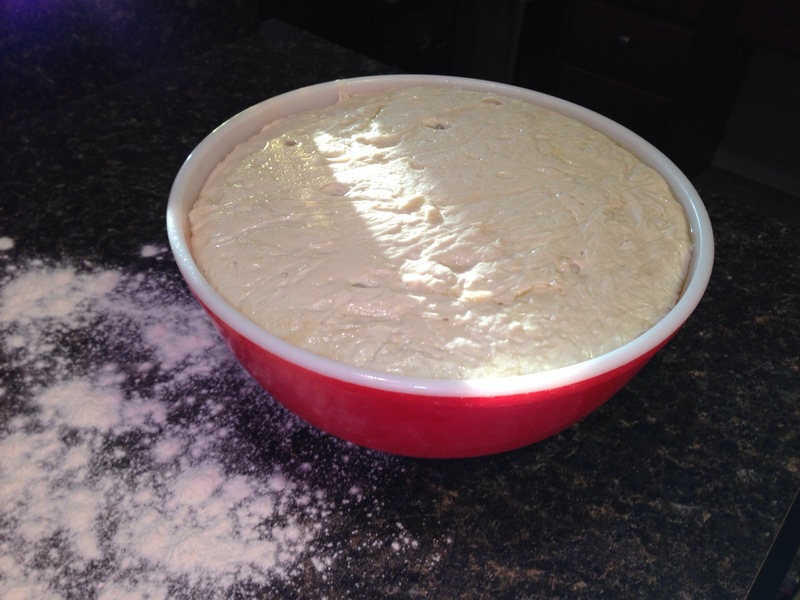 Put your dough into a bowl and allow to rise 8 to 13 hours! Yes, it takes that long! Yes, it will eventually work! Yes, it’s worth the wait! 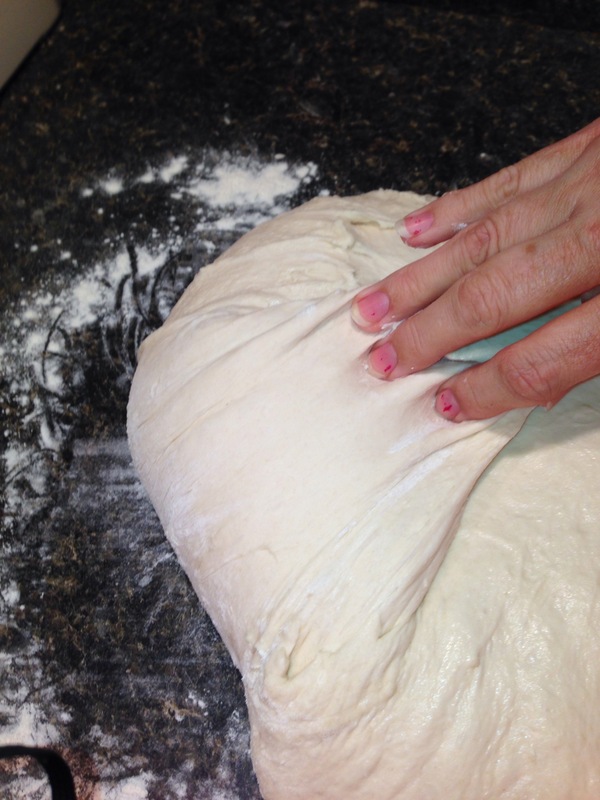 Shaping the dough into a round. Once you have gone all the way around the dough and folded it upon itself. Place the round on a baking sheet sprinkled with corn meal. 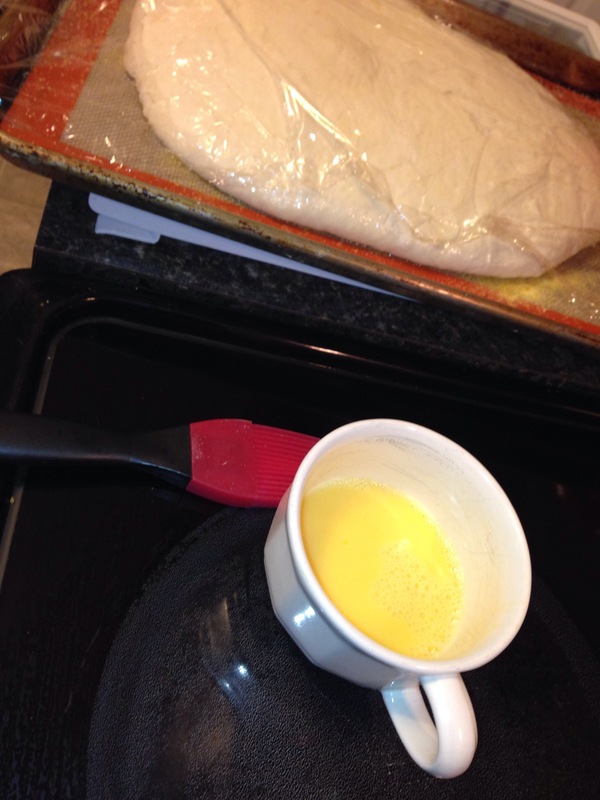 The dough is ready for a second rise. Allow the round to rise for 3 hours. Finally, cut tic-tac-toe slits into the dough with a new razor blade. Brush with an egg wash, and place into a hot 400 degree oven for 10 minutes. After 10 minutes, reduce heat to 375 degrees and continue baking an additional 45 minutes. 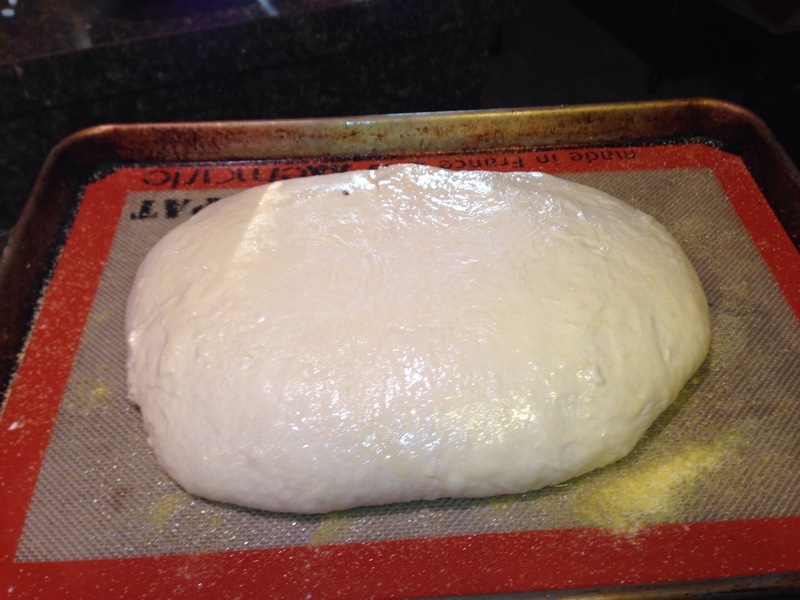 The dough round is rising for a second time for 3 hours. Brush the loaf you just scored with a razor blade with the egg wash. This is a huge, crusty loaf of San Francisco Sour Dough Bread. The end product was a very beautiful round of San Francisco Sour Dough Bread. It is a very tasty bread. Next time, I will be making it in loaf pans to see how it holds up for sandwich bread. I am very encouraged by my first loaf. I feel like it can only get better as I get better at making it! 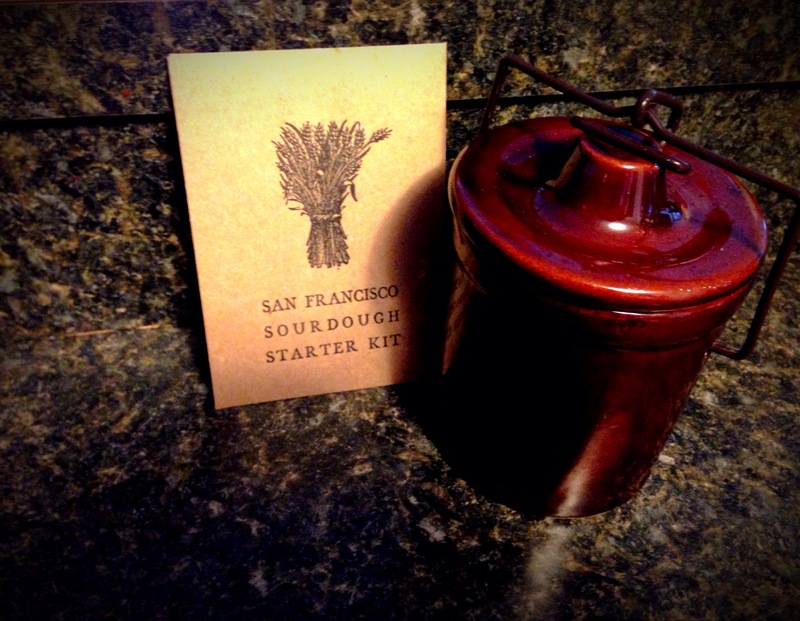 Hope you give the San Francisco Starter a try if you enjoy baking bread or want to start. Today’s post and design is inspired by Memphis. Memphis has a big chunk of my heart due to the many years that we lived there. The friend connections are priceless to our family and we are really looking forward to an upcoming trip to see all of the amazing people. I was not born a “southerner,” in fact, I am routinely referred to as a “yankee” by my husband’s family and most native Memphians. I didn’t realize how little I knew about the “Civil War” until I very abruptly learned that it seems to still be alive and “kickin” in a lot of southern people. Since I did not speak the accent or even realize the differences in dialect, I was at a huge disadvantage when desiring to just “fit” in. I quickly learned that “I”, have the accent! A “yankee” accent! Now that I am once again living in the midwest, I am told that I now have a “southern” accent! So to sum that up….no one understands anything I say! (Insert big smile) I am pretty sure I unknowingly offend on a daily basis. This post is bringing back some fun memories of more differences specifically in the food category. Growing up, both of my grandmothers were excellent cooks! They always made everything from scratch and most of our food came from gardens they planted and took care of. Tomatoes, carrots, peas, cucumbers, corn, cabbage, onions, potatoes, were all a part of the big half an acre garden plots. Well, when I got to Memphis, I learned that peas were no longer a sweet little green ball inside of a pod. Peas were now purple or had black eyes! They were allowed to sit out in the sun until the pods swiveled up and the little purple and black eyed fellows became hard as a rock! There’s even a special machine they throw them into to separate the crusty pods from the rock hard peas! Then, you get to boil them until you have a pan full of the dirtiest water you have ever seen….then you probably get to boil then another hour or so because they still are rock hard. Give me my cute little green balls of sweetness any day over purple hull or black eyed peas! I will move on today but I do have to address cornbread, spaghetti, barbecue, fish, baked beans, turkey and dressing, pies and cake at some point.